The YMCA provides a service that impacts generations and you are an integral part in that process. Together, we extended $528,678 in scholarships to our community. Our programs help our members live healthier and develop long lasting connections and this Y would not be possible without your help. Your generosity helps us maintain the relationships we have built with our members and allows us to extend our reach farther and found new relationships. We are so grateful to partner with individuals like you that believe in our cause and help us to keep it rolling. Thank you for trusting us to help our community and we hope you continue making the Y the best it can be. Support the 1 in 4! 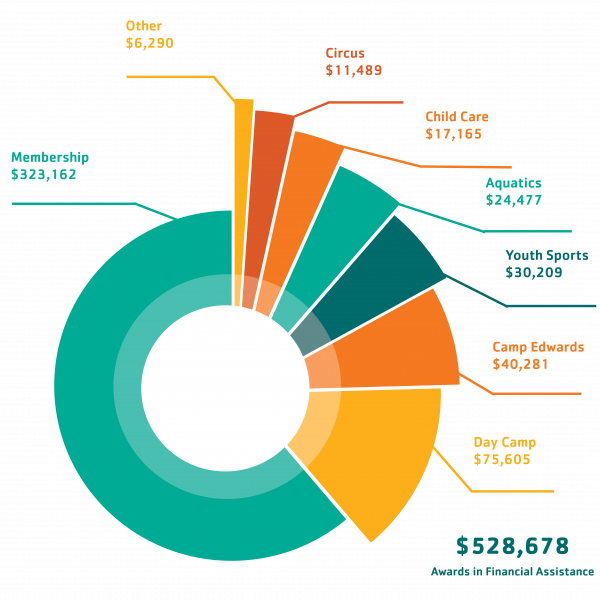 Advocate for the Y and help support the 1 in 4 that rely on Financial Assistance. From participating in our Annual Support Campaign to donating to our cause, help support the 1 in 4. With 33,305 members total, a total of 1 in 4 of our members receive financial assistance to reach their fitness or wellness goals. Safety Around Water is a YMCA initiative to eliminate the risks associated with poor or lack of water safety education. In the past year, 1,131 kids enjoyed free water safety training in our Safety Around Water program. Supported through donations, the Y is eliminating the barriers that keep many kids from developing safety skills in water. The Y’s Legal Aid Clinic makes quality legal aid accessible to the entire community. Providing low-cost services, our Legal Aid Clinic serves hundreds each year. The Y’s Legal Aid Clinic provides low-cost legal services to the entire community. In 2017-2018, we served 870 clients thanks to generous support of donors. Every year, we host an Annual Campaign set with ambitious goals. It is through the determination of our dedicated volunteers and donors that the YMCA is able to move our mission forward and grow our cause. All of the funds raised from our Annual Campaign go directly into our Financial Assistance program, which helps subsidize all of our programming so we can work towards a connected community. Thank you to all who have helped to make the 2018 Annual Campaign successful. We’re forging a brighter future one opportunity at a time. You may contribute online right now. Our non-profit organization accept donations that help pay for community members to receive programs & services from the Y. Contact the YMCA of the East Valley Business Development team: (909) 798-9622. We also accept credit card donations or pledges by phone. You may send your donation by mail to assist the YMCA with community efforts. Checks are payable to: YMCA of the East Valley. If you would like to make a stock donation to the YMCA of the East Valley, please email Doug Thorne at dthorne@ymcaeastvalley.org.